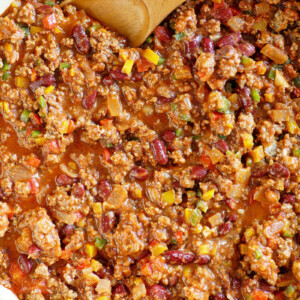 This Beef and Dark Beer Chili is perfect for serving to a large crowd. Toast the cumin and coriander in a skillet over medium heat until darker and beginning to smoke, about 4 minutes. Cool. Sauté the beef in a heavy large pot over medium-high heat until no longer pink, breaking up with spoon, about 8 minutes. Heat the oil in a large skillet over medium-high heat. Add the onions, all bell peppers, and jalapeños. Sauté until the vegetables begin to soften, about 15 minutes. Add the mixture to the pot with the meat. Mix in the toasted spices, chili powder, and chipotle chiles. Add the crushed tomatoes, beans and beer. Bring the chili to a boil, stirring occasionally. Reduce heat and simmer 20 minutes, stirring often. Season with salt and pepper. Ladle the chili into bowls. Serve with sour cream, green onions and cheese. *For best results, pick out a five-pound boneless chuck roast and have the butcher grind it for you. *Chipotle chilies in adobo sauce are found in the Latin foods section of most markets and at specialty foods stores and Latin markets. *This chili can be made ahead. Cool slightly. Refrigerate uncovered until cold, then cover and keep refrigerated up to 2 days (or freeze up to 1 month). Re-warm over medium-low heat.